When life gets crazy in our home, it’s hard to find time to connect or to even remember that we need to connect much less hang out. When our boys were young we started a family week night. During our busy seasons, sometimes it gets skipped but for the most part we try to stick to it. We have done all of these and we have enjoyed them all! You can tweak them to fit your child’s development and your climate/season. Feel free to print the above printable. Just right-click and then copy and paste to your document. I would appreciate it, if you post it online to link back to me. Just a couple of suggestions when planning your family date night: Check how much allotted time you have, pick an activity,decide what time of the day is best, figure out what day out of the week or month you want to have your family date night and stick to it, figure out what your family likes to do and most of all just have fun even if your date night is not going as planned. If you’re looking for ideas for you and your spouse we love and use this 12 Dates 12 Months system. It works great! Go HERE for information on how to put it together. It was really easy and it makes a wonderful gift. Make ravioli or whatever pasta you want- We googled a recipe and had so much fun making it. I shared here our Making Ravioli With the Kids experience and how to. Board games– Pull out the board games, snacks and have some fun! Hiking– Our family loves to explore the outdoors so go discover your neck of the woods. 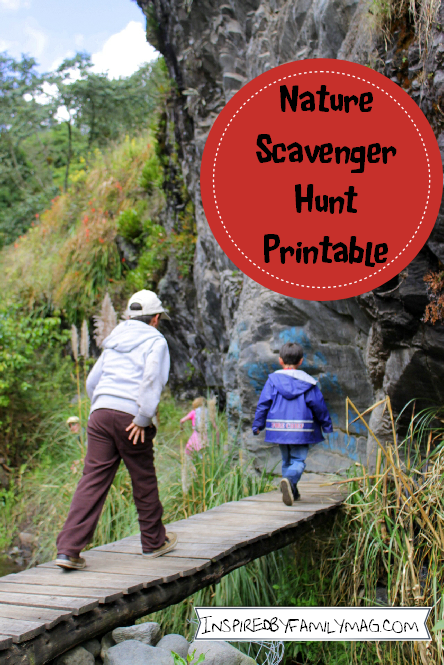 Use this Nature Scavenger Hunt I share over here, to add a bit more fun! Camping Night – backyard or living room fort camping counts. Karaoke Night– Just because you don’t own a karaoke machine it doesn’t let you off the hook on this one. You can google karaoke songs online and it will pull up different websites that have a karaoke video with the words and the bouncy ball to tell you when to keep singing. My boys wanted to do this over and over again after the first night. I must admit, it was fun to be silly together. Dance Party– Go to Youtube or put on your favorite CD and have a dance party. You can even use your Wii Just Dance game. Here are some more fun Musical Party Games. Pizza making night– Make the dough from scratch or buy the premade pizza bread and let each person make their own little personalized pizzas. Family Bike Rides– I love our family bike days. We bought a bike trailer for our baby and we do rounds around the park. I share here some tips for your family bike ride. Scavenger Hunt– We did an alphabet photo scavenger hunt as a family. It wasn’t a race we just went to the mall and started taking pictures of things that went with the appropriate letter. Our boys even put on some silly things to get a good “letter” picture. Progressive Dinner have all 3 courses in different places- A mall or a place with lots of restaurants clumped together would work best. Remember to start early or only do 2 courses so you’re not up late. Picnic– Our evenings are chilly here year round so sometimes we have picnics in our living room, sometimes in our yard and our boys favorite–in the park. Bowling– Some bowling alleys have themed nights and music. Laser Tag– I must say this is one of my favorites. It’s so much fun! Paintball– If you have little ones this may not be the best activity. Fun Park– Find a family entertainment park and ride the silly rides and play miniature golf. Fondue Night– Even if you don’t have a fondue pot you can just place some chocolate in a bowl and microwave it. Cut up your favorite dippable fruits and snacks and your done. Smorgasbord Meal– Go to the grocery store give each child $5 and have them buy 3 things they want to include in dinner. Once you get home you have to use up everything you bought to make the meal. You may need to set some guidelines so you don’t end up with snack cakes, chips and ice cream. I explain the details to our Smorgasbord Meal here. Volunteer Together– Another fun idea we love to do. Find a nursery home, soup kitchen or just make sandwiches or buy happy meals and find a place to give them out. Here’s a list with tons of great ideas: Make a Difference Bucket List and this is one of our most recent service projects we did as a family Hunger Heroes our kids loved serving with their no sew capes. Movie & Dinner– Easy one! Pick a movie and eat while you watch it. This is a huge treat in our home because we rarely watch tv and we definitely don’t eat meals while watching tv. Outdoor Movie Night– Set your projector outside, pick a movie and grab some blankets and pillows. We like to do this with our family friends. Here are some simple ideas to make it fabulous: Outdoor Movie Fun. Around the World Night– Pick a country and serve a dish from that country. If you don’t know how to cook it order take out. Here’s a 10 Kid Friendly Around the World Recipes post. Snowball Fight– If you dont’ get snow don’t worry you can still partake. We use newspaper, tissue paper, wrapping paper to have snow ball fights. Artsy Fartsy Night– Find your nearest art museum, science museum and make a visit. Check out what ballet, opera or symphony is playing in town and get dressed up and go as a family. Some places even offer family nights. Star Gazing – Grab some pillows, jackets and discover the world above you. There are apps you can download to your phone to help you recognize the stars. Carousel Riding– It doesn’t matter how old you are. Just take the whole family and go ride the carousel at your mall or zoo. Water gun Fight– You can even use nerf guns if it’s too cold in your part of the world to get wet. Book Reading using different Accents– Another of my favorites! I have been doing this activity since I was single with college friends. It is so fun and our boys love it. I even catch them reading aloud sometimes in a different accent. My accent always ends up having a southern drawl to it. Homemade Ice cream Night- You don’t need an ice cream maker for this one. There are lots of recipes online to make it in a bag but this is another great one: Easiest Ice Cream Ever recipe. Plant a herb garden– My middle child has a love for dirt. So he enjoys planting things. A quick gardening idea fun post. Make a Fort (indoor or outdoor)- The lovely thing about forts is that they are fun no matter how you set them up or what activity you do inside them. Grab some blankets and make a couch and blankets fort. Or I share here on our outdoor No-Sew Fort Fun idea. Silly Dress up evening- Have everyone in your family dress up silly. Take some pictures. And go out to eat a meal, dessert or for a stroll in the park. Hide and Seek in the dark! Stay inside or take it outdoors. Book Fun– Go to the library or Barnes and Noble and find books you want to share with each other (no purchase necessary). This was another fun thing we did in college. Most of the time we would end up in the children section at Barnes, ha. What are some of the things you do for your family time? I love your idea for making pasta together… that’s definitely one we will have to try soon! Thanks for sharing this! I am one of the co-hosts of the Weekly Kid’s Co-op and will be featuring this as one of my TOP 3 for tomorrow’s link-up. I came over to visit from Wow Me Wednesday. 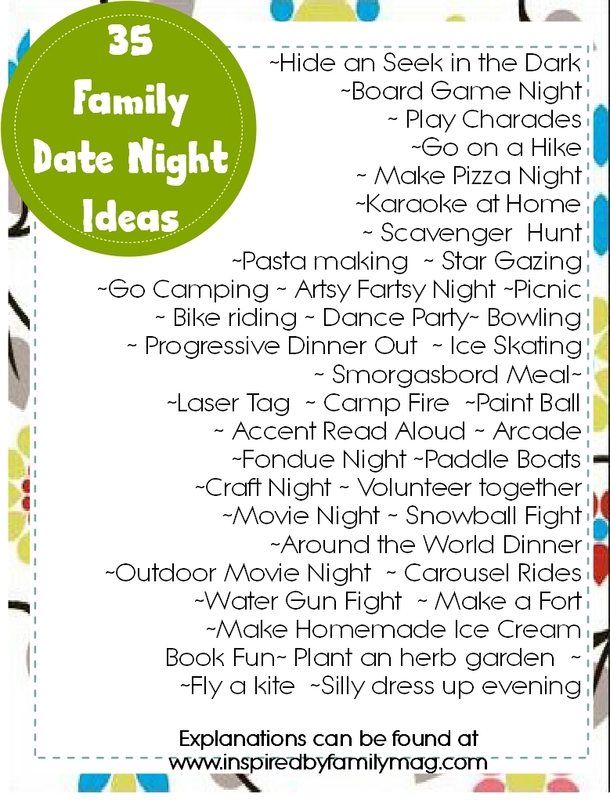 I love these ideas I have four children and I am always looking for ways to have fun family nights. It seems we always resort to dinner and a movie. Thank you so much for sharing. Just like you go on a date with your spouse to spend one-on-one time together, you can (and I propose, you should) do the same with your children! A study from the Journal of Marriage and Family showed that kids who spend more time with their parents are less likely to abuse alcohol or drugs; are less likely to engage in risky, delinquent, or illegal behaviors; and achieve better math scores.